WRAPUP: A great day for a parade.. very warm weather brought out 10 MINIs for a fun parade. 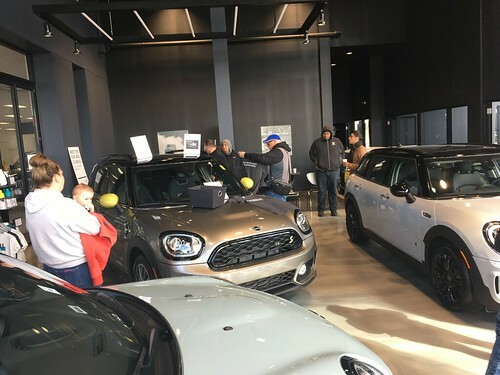 Big crowds with lots of enthusiasm for MINIs. 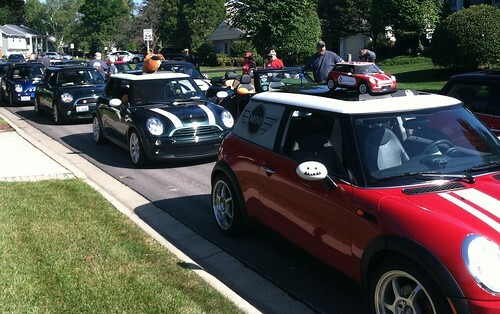 MINIs will be on parade at the Buffalo Grove Parade on Sunday September 2nd!! WHEN: Sunday September 2nd.. Staging time is 10am or earlier, because the spaces fill up. Parade starts at 11am. Note.. we will be towards the back of the parade, so our actual start time will be later. WHERE: Indian Hill dr Just south of Plum Grove Circle Staging area will be Zone E formation numbers 88 thru 93 Stage/line up 3 across if possible. The Parade route will head east on Bernard Drive from Indian Hill Drive to Raupp Boulevard, then north to St. Mary’s Parkway to Crestview Terrace for disassembly. The principal and essential purpose of the Buffalo Grove Day Parade is to entertain all Village residents. The parade is for entertainment purposes only and not to publicize a group’s personal agenda. The parade also provides various Village groups (clubs, veterans’ organizations, etc.) with an opportunity for public exposure. Refrain from STOPPING while marching. This causes a huge gap the parade. Loud whistles or other noisemakers and water cannons and water guns are specifically prohibited. Nothing maybe thrown from a vehicle to the crowd along the parade route. If anyone wishes to distribute anything (including candy, balloons, etc.) it must be done by persons walking along the curb. Distribution of literature is not allowed because of significant litter problems. Vehicle speeds must be no faster than normal pedestrian walking speeds, unless specifically authorized by the Parade Chairman, and then only for entertainment purposes. Floats and other display/signed vehicles should be in good taste and should not detract from the entertainment purpose of the parade. . In order to maintain a variety of participants, parade position is at the discretion of the Parade chairman. Once a parade position has been assigned, under no circumstances can it be changed. Please do not ask the Parade Marshals to trade places with other groups because they have no authority to do so. Sherri and I will also be there. Planning on coming down with Scooby again this year . It was a lot of fun last year! If though, you are pushing the maximum number of cars, I am happy to step aside for anyone else.